Poachers who hunt elephants in an attempt to take their ivory may have an obstacle they simply cannot overcome in the form of nature’s most powerful force, natural selection. There are at least two African national parks which have suffered greatly from poaching. What is truly fascinating is that in these parks the majority of females are now born without tusks. This is an astonishing development and were the trend to carry into the wider elephant population, it would have dramatic implications on elephant poaching. Up until the 1990’s, Mozambique’s Gorongosa National Park served as home to approximately 2,500 elephants. During the course of the country’s civil war which ended in 1992, about 90 per cent of the park’s population were killed. Many of those elephants lost their lives to poachers hunting them for their ivory tusks, with the money generated used to purchase weapons and food for the fighters. It now appears that this massacre resulted in a strong form of natural selection and evolution, increasing the frequency of genetic variations that produce females without tusks and males that have smaller tusks. Generally speaking less than four percent of female elephants are born tuskless, but experts say in Gorongosa there has been a huge shift. Tusks suddenly became a liability which meant that animals with tusks and therefore the genes that cause tusks to grow have been removed by poachers from the population. Elephants without tusks have no appeal to poachers and continue to survive, which means those genes get passed on to future generations and there is an increase in the number of elephants born without tusks. South Africa’s Addo Elephant National Park underwent a similar experience. Poaching has resulted 98 per cent of the female elephants in the park being born without tusks. Tusks also seem to be growing smaller. In one part of Kenya where poaching is rampant, male elephants have tusks which are 20 per cent smaller whilst female elephants’ tusks are more than 33 per cent smaller. This is quite astonishing and represents a massive shift. As a rule, males have much bigger and heavier tusks in comparison to females, so naturally poachers target them first. 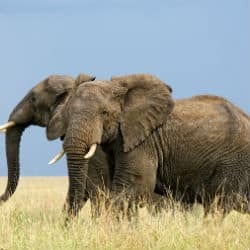 Experts are not sure exactly why males have not yet evolved to become tuskless, though it is believed that males use their tusks to do battle with other males for access to females. The theory is that males benefit greatly from their tusks and that is why the potential for the gender to become tuskless has been weeded out.